One of the most well regarded strategy games of all time has been converted into an MMORPG. Ubisoft and Chinese-based developer TQ Digital have announced the closed beta for upcoming MMORPG Heroes of Might and Magic Online, based on the classic turn-based strategy/RPG series of the same name. 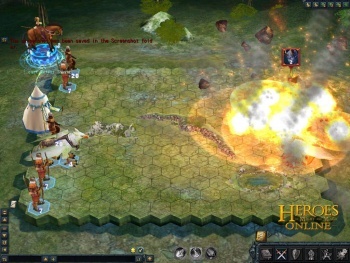 In contrast to World of Warcraft, which disposed of Warcraft's strategy-based play, Heroes of Might and Magic Online aims to remain faithful to the series' classic gameplay, with a 2.5D graphical style lifted from Heroes of Might and Magic V, but also with a splash of new elements. Quite honestly, I'm a little confused as to how Heroes of Might and Magic Online will play out despite its descriptions. Heroes of Might and Magic Online will be a turn-based game and will still use a tactical grid for battles, but TQ Digital is calling it the "first persistent world turn-based strategy MMO." The game will offer "in excess of hundreds of unique campaigns, each with epic storylines and goals including 10 chapters of battlefield missions" and also "randomly generated combat maps." Just like in other MMOGs, players can form guilds to strengthen their factions, and TQ is implementing a PK (player-killing) system that will include "Team PK and Extreme PK." From being a fan of the Heroes and Might and Magic strategy games, I'm unsure how a PK system would work for Heroes of Might and Magic Online, but I'm definitely intrigued. Other aspects, from the spell-upgrading system to the Town Prestige system, where towns can be built up but also attacked and bought out, sound interesting too. Will players have a town that they hold for as long as they can in a persistent world, or are they held like they were in the series' past for only a one-map game? Heroes of Might and Magic Online's closed beta will begin in May, and those interested can sign up on the game's official website. I know I'm going to try to get in just to see how the game works.